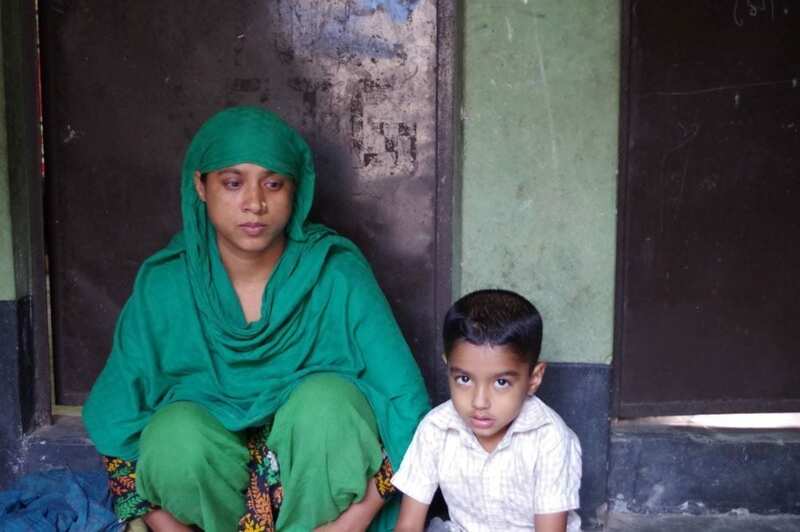 Sumi Abedin, a 19-year-old Bangladesh garment worker, was among the survivors of another horrific workplace tragedy, the disastrous Tazreen Fashions Ltd. factory fire that killed 112 workers in November (injured survivors describe their efforts at survival in a video here). Sumi recently traveled to the United States on a trip to meet with congressional lawmakers and describe the unsafe and deadly working conditions at Tazreen—conditions similar to those many Bangladesh garment workers face every day. Solidarity Center staff compiled this report from her discussions in Washington, D.C.
On Nov. 24, 2012, Sumi finished lunch and, as she did every other work day, returned to stitching clothes on the fourth floor of the Tazreen garment factory. Hours later, she heard co-workers talking about a fire on the first floor. Her managers told them to get back to work—they said there was no fire. After a while, smoke began rising through the stairwells, and workers panicked. Along with her colleagues, Sumi ran for the stairs, but the two women’s stairwells were locked. The third, reserved for men and official visitors, was overwhelmed with workers who had fallen while trying to escape the burning building. The electricity had gone out, and the stairwell was clogged with thick smoke. Unable to reach the first floor, Sumi made her way to the third floor, following co-workers who used their cell phones as flashlights. As some workers fought to open the barred windows, one of the mechanics managed to pry open the exhaust fan. Sumi faced a choice—risk death by remaining in the building or by jumping. She wanted her parents to be able to identify her body, so she chose to jump from the third floor. Sumi passed out after the fall, but when she regained consciousness, she saw that her male colleague who had jumped with her lay dead next to her side. When she tried to stand, she realized that her right leg was broken, as was her left hand. She called to another worker to help her get home, where she found her grieving parents mourning her death. Sumi’s parents rushed to a neighbor’s house to borrow money so she could go to the hospital. After receiving treatment for smoke inhalation, Sumi was sent to another hospital that was better equipped to treat her broken bones. As compensation, Li & Fung, a multinational supply-chain management company based in Hong Kong, Special Administrative Region of China, paid Sumi and some of the other survivors $1,200 through the Bangladesh Garment Manufacturers & Exporters Association (BGMEA). She was required to sign documentation she did not understand to receive the payment. The majority of the money has been spent on her medical bills, and she is still unable to work. The ready-made garment sector is her best hope for employment, but her injuries prevent her from holding a stitching job. Sumi also has nightmares about the fire and says she is too afraid to go back to a factory. Other workers sustained injuries even more debilitating than Sumi’s, but they, too, received only $1,200 and back-pay. Sumi says responsibility for compensating survivors and families of those deceased should be shared among the factory owners, BGMEA, the Bangladesh government and the corporate brands that sourced from the factory. Sumi, who started working in garment factories at age 13, recounts that while she was at Tazreen, factory auditors representing a variety of buyers visited the factory regularly, often several times a month. Yet managers always knew about the audits in advance, and before each visit, they coached workers on how to answer questions. Managers also provided temporary safety equipment and “fire committee” T-shirts to workers, even though a real fire committee did not exist. Managers told workers to lie about factory conditions, such as access to clean drinking water and timely payment of wages. Managers also doubled as translators for workers who were interviewed. As soon as auditors left, managers removed safety equipment, locked stairwells and returned fabric stockpiles to their “storage” spaces—which often were building exits. For survivors of the Tazreen fire who have received compensation, the funds fail to provide the long-term health care that many require. Meanwhile, 41 other factories in Bangladesh have had fires or fire-related incidents since the Tazreen tragedy, according to statistics compiled by the Solidarity Center in Bangladesh, illustrating the continuing disregard for human rights and human lives in Bangladesh’s garment industry.